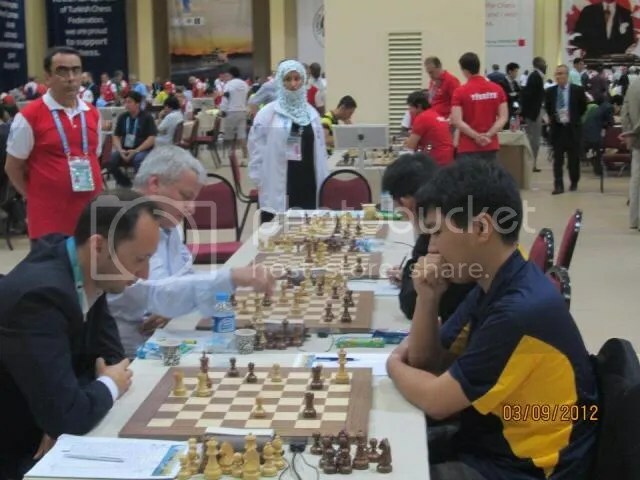 Round 6 of the 40th Chess Olympiad was described as a ‘Classic Monster Matches‘, a Godzilla and King Kong fights among the title contenders ! 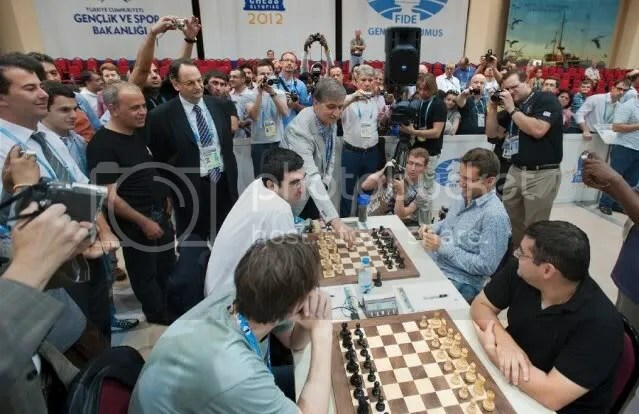 In the Open section, top seeds Russia (#1) and Armenia (#3) had a classic battle on boards 1 & 2 with Russian GM Kramnik prevailing against GM Aronian in Bo.1 while on Bo.2 Armenia’s GM Movsesian hit back against Russia’s GM Grischuk to get even. The bottom boards 3&4 drew their games and the match was tied 2-2. 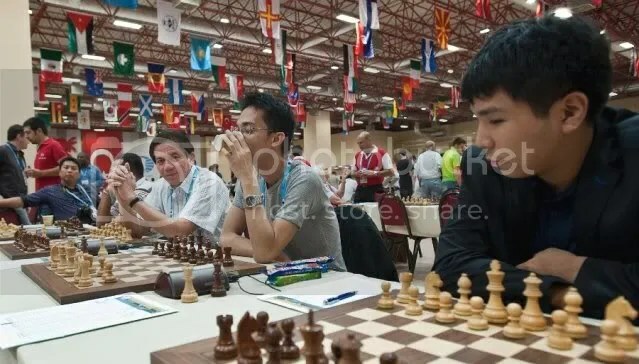 The ‘Big blows’ were delivered by China (#6), Azerbaijan(#7), Ukraine(#2) & Hungary(#4) against their respective opponents that resulted to wins in R6. But the BIG SURPRISE and an UPSET in R6 was delivered by the #35 seed Team Philippines(Open) when it upended the #10 seed Bulgaria with a 2½-1½ score. Philippines Bo.4 GM Mark Paragua made the initial draw with the higher rated GM Delchev. This was followed by another draw from AFGM Eugene Torre against his much higher rated rival Super GM Cheparinov on Bo 3. The much awaited 2nd encounter at Bo.1 between GM Wesley So and Hyper GM Veselin Topalov also ended in a amazing draw in 48 moves. Wesley So’s brand new coach at Webster University GM Susan Polgar tweeted that … “a few days ago Wesley So drew with World #2 (Aronian). Today he draws former World Champion & World #1 Topalov”. GM Wesley So with this feat, registered his 35th “No-Loss Record Vs GMs with 2700+ rating“ in his young and promising chess career. 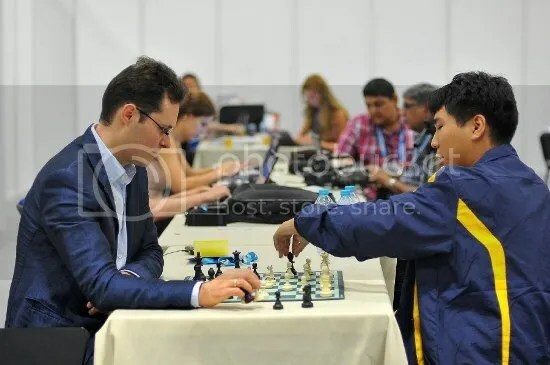 But the most unbelievable … ‘the biggest surprise among the surprises’ was delivered at Bo.2 by no less than GM Oliver Barbosa that turned an inferior & losing position into a ‘Big Win’! This crucial win by Barbosa produced the much needed full point to win the match for Team Philippines(Open). After the battle smoke of R6 was gone Team Philippines, now with 10 match points from its 5Wins-1Loss, is ranked fifth in the standing among the ‘Chess Titans & Monsters’ the title contenders. Not as fortunate as the Team Philippines (Open) were the Team Philippines (Women), who absorbed their 2nd losses in six rounds, a 1-3 defeat at the hands of the #14 seed France. WIM Catherine Perena delivered the lone win for the Filipinas. 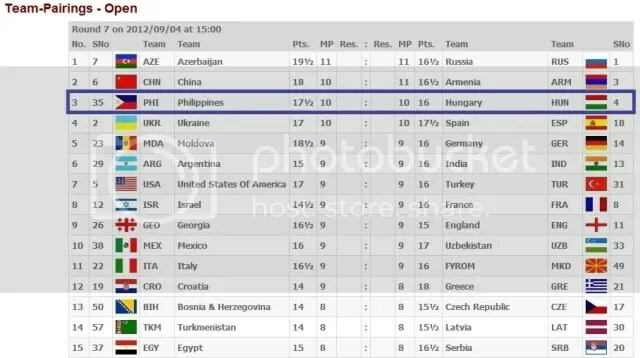 The loss placed Team Philippines(Women) in the 31st position after R6. 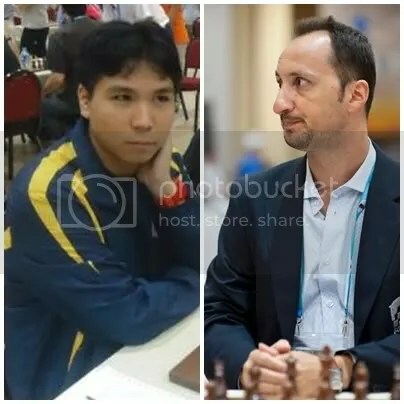 Team Philippines(Open) will now be fitted against another ‘Chess Titan’, 3-time Olympiad Champion and the #4 seed Hungary. Team Philippines(Women) will play against #52 seed Portugal, both with 8 match points after 6 rounds. 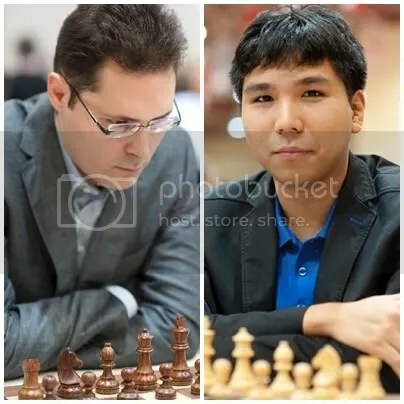 For the 36th times GM Wesley So will be playing a Hyper GM in the person of Hungary’s Bo.1 Peter Leko (2737) and again will place his “No-Loss Record Vs GMs with 2700+ rating“ on the line. We will witness in R7 whether his streak will continue or stop at 35th ? 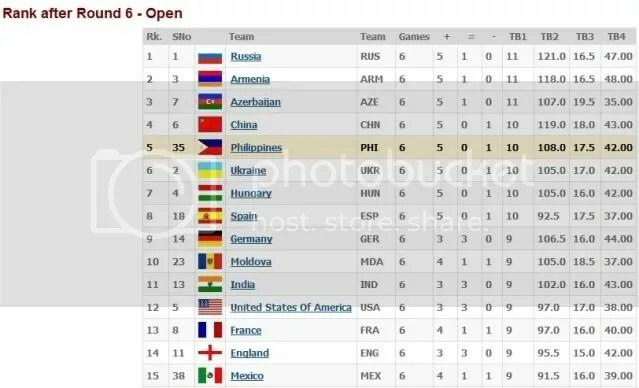 With the draw against against the powerhouse & #4 seed Hungary @ 2-2, Team Philippines (Open) is now ranked at Nr 10 in the current standing after R7 with 11 match points from its 5Wins-1Draw-1Loss record after R7. Team Philippines(Women), scored a 3-1 win against Portugal bringing its match points total to 10 from its 5Wins & 2Losses record after R7. It now rank 20th in the current Team Standings.